I brought back an old, tired, ‘Eau de Cologne’ mint plant from Plot #59 yesterday. The pot is disintegrating and is destined for crocks, and the plant itself – which isn’t in a good condition at all – is likely to end up in the compost. Before that happens though, I’ve decided to take a trio of cuttings of slightly different types so see which, if any of them, takes and performs noticeably better. Varying amounts of stem, root and leaf left on these propagules. In this highly unscientific experiment, I’ve put the propagules into pots of gritty seed compost. In one (top-right), a bare stem with no established roots or shoots. In another (middle), a rooted stem with a small amount of leaf already established. In the third (on the left), a couple of quite well-rooted stems, with a slightly larger amount of leaf. 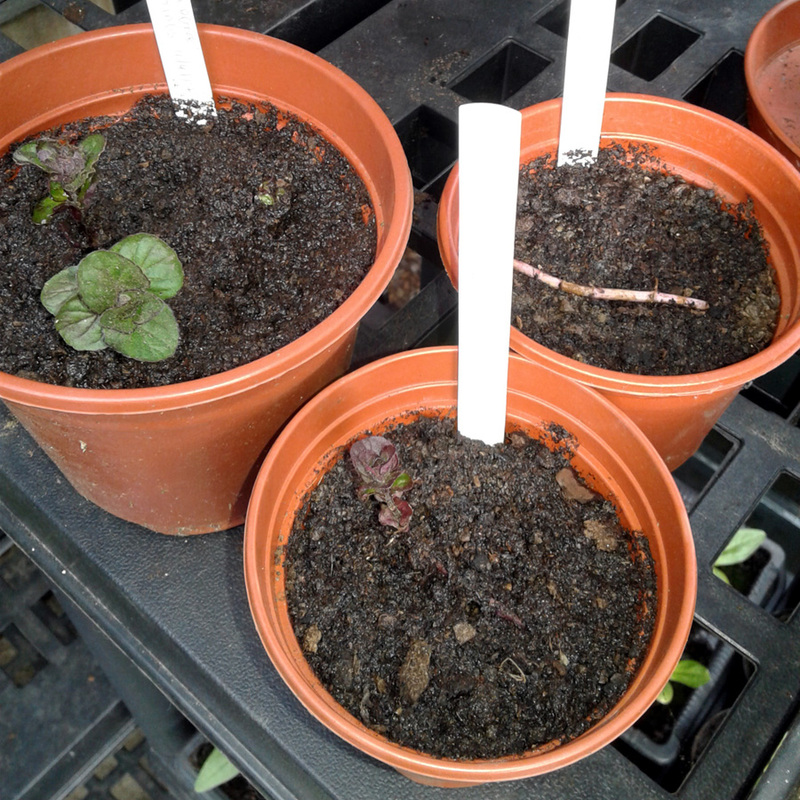 Mint is hardy enough, so they’ve been left in the unheated greenhouse, rather than the heated propagator indoors. Theoretically, the leafier stems should be able to photosynthesise straight away and use the energy to produce more root and stem material, establishing quickly. Then again, they’ll also be losing moisture by transporation and evaporation from the leaf surfaces and using up their internal energy stores; it’s a race between the processes to see which one wins out. At the other end of the scale, the bare stem will need to use its stored energy to produce root, shoot and leaf material, but shouldn’t be losing much moisture at all. So it might take longer, but could establish a stronger plantlet in the long run. It’ll be interesting to see whether there are any noticeable differences between the hare and tortoise approach. Although of course I’d need to set up a larger sample to establish any sort of definite pattern. Edit, 17.05.17 I’ve posted a quick one-month-on update if anyone would like to see how these cuttings are doing. My money would be on the rooted cuttings – but I would be intrigued to know the upshot in due course. I’m propagating mint too. My own Applemint that looked like it was dead and an exhausted supermarket pot from last summer that I potted up and forgot about over winter. This spring I just tore the rootball apart and potted up any bits that looked hopeful (having at least some root and some shoots extending from them – so I wasn’t as scientific as you). I’ve now got half a dozen cheery looking pots suitable for the kitchen windowsill. The applemint was slower to show any sign of activity but I have recently potted up a long runner with a leaf or two at one end. If all goes well (and shoots appear above soil level) I will be snipping it into 4 sections to pot up individually! Hope springs eternal – and so does mint. Hi Mal – It’s wonderfully tough stuff, mint, so it should withstand quite a bit of ripping apart and potting up. I’ve got a couple more tired old plants – the legacy of a house move a couple of years back, when they were dumped down at the allotment and forgotten about – so I’ll be digging those out and doing something similar before too long. I’ve got plans for a rejuvenated herb area at our new place and mint is going to play a big part in the herbal tea-ingredients section. Hi Darren, Yes it is a bit of a brutish family, so I take it you are not going to let it loose amongst any of your other herbs? Containerised only!!! Absolutely right. In fact, the whole herb area will be containerised, mainly because there won’t be a planting bed per se where I’m planning to establish them. Plus it will be good to be able to move some of the less hardy specimens into the greenhouse over winter if necessary. Yes, I loose my tarragon every year. I potted some up last year and popped it in the greenhouse, but the frost got to it all the same! We will have to find house room for it next winter! I used to love taking cuttings – I should get back into it! There’s something very satisfying about creating your own plants for free, isn’t there? Early days yet, but there are new buds showing on the bare-stem cutting and the stem+leaf cuttings don’t seem to have died just yet, so that’s a positive.